There are many different types of sunspots that range in severity. If you’re concerned about a particular mark on your skin, below is a brief description of the most common types of sunspots and skin cancers with reference images to compare to. This will give you an idea of what your spot may be, but with any skin changes we urge you to book an appointment so that it can be properly assessed and diagnosed by an expert. Sunspots are due to chronic sun exposure. They are clearly visible areas of change in the skin, usually dry, irritable and scaly, affecting a relatively large area. They are precancerous, though in some places such as Europe they are regarded as skin cancer. Most sunspots need to be treated due to the potential of skin cancer. 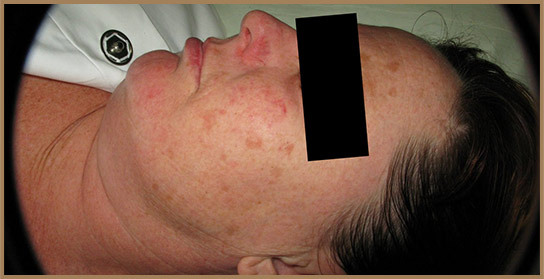 Molescreen PDT offers various treatments for sunspots depending on the type and severity. These treatments range from a simple CO2 peel for small areas to photodynamic therapy (PDT) for larger areas. We do not offer freezing with nitrogen because of scarring as well as the high likelihood of recurrence and the difficulty of treating large areas. Click here to read more about the risks of cryotherapy. Dry scaly and sometimes sore patches mostly seen on face, ears, backs of hands and forearms. 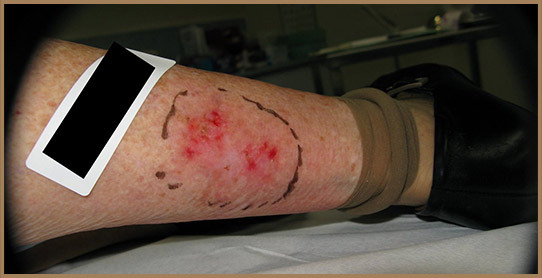 In extensively damaged skin they are also seen on backs and legs and are rarely seen on covered areas. Solar Keratosis are caused by long term sun exposure without sun protection and are more common on outdoor workers and those who have played a lot of sport, presenting in most of the Queensland population after the age of 40. They are precancerous, mostly leading to Bowen’s Disease or Squamous Cell Carcinoma (SCC) and may contribute to a form of melanoma in later life. Easily seen and diagnosed, especially with computerised dermoscopy which produces a highly magnified image of the skin cancer. Mostly caused by DNA damage from direct ultraviolet light. A common but usually non-fatal form of skin cancer that does not usually metastasise (spread to involve other organs). BCC is likely to recur unless it is adequately removed initially with surgery or, if suitable, PDT. It indicates a strong risk of further skin cancer, including melanoma, and an additional risk factor for internal cancers. In Queensland, 60% of the population gets a skin cancer in their lifetime and most of them are BCCs. This is a fluoroscopy image taken before Metvix activation showing the extent of the BCC being treated. This demonstrates that there is often more BCC present than is visible to the naked eye. Multifocal BCC is usually 5mm to 10mm and irregular shaped, pink or red, flat and scaly. If present for some time they can grow to be much larger and may ulcerate. They are caused by long term sun exposure without sun protection and appear on exposed surfaces and areas poorly protected from the sun such as the scalp, behind the ears, and on the back. Multifocal BCCs are very common, usually non-fatal but may be disfiguring, superficial, and often present with associated satellites which may be difficult to see. If untreated they may become invasive over the long term. Removal may require skin grafts or flaps depending on size and location and if they are not removed properly they will recur and lead to major problems. They can be treated with Metvix PDT or Aldara but may require extensive surgery and occasionally radiotherapy. A less common but more dangerous form of skin cancer that may metastasise if not treated appropriately, making correct diagnosis important. SCC nearly always requires surgical removal with adequate margins of normal skin. Often found in a background of solar keratosis in areas damaged by chronic sunlight exposure. They are dry, can be sore, pink or red in colour, and are scaly, mostly seen on face, ears, backs of hands and forearms. In rare cases of extremely damaged skin they can be found on backs and legs. Invasive SCCs are liable to spread to other body organs and should be removed surgically with an adequate margin. Bowen’s disease is similar to solar keratoses and is a non-invasive form of SCC. It presents in dry, scaly, sometimes sore patches, mostly seen on the face, ears, backs of hands, and forearms. In very damaged skin it can also be found on backs and legs but is rare in covered areas. It is a low grade, non-invasive form of skin cancer caused by long term sun exposure without sun protection and is very common, though often undiagnosed. Bowen’s disease may indicate increased risk of more dangerous skin cancers. After diagnosis with a biopsy it may be treated with shaving and cautery alongside careful monitoring for recurrence. Can also be treated with photodynamic therapy (PDT) with the advantage of treating surrounding areas that may not be visible to the eye. Cutting them out is not usually required. A fast growing wart-like skin tumor usually found on lower legs and forearms but occasionally on other areas of sun damaged skin. Best removed sooner rather than later as it may outgrow its blood supply and fall off, leaving a large unsightly scar, or become an invasive SCC. It may respond to removal by shaving and cautery but if there is any evidence of invasive SCC they should be removed surgically with a wide excision. The most common deadly skin cancer is Melanoma, which can be found anywhere on the body. All new moles should be viewed with suspicion, especially when the patient is over the age of 45 years. Melanomas always require surgical removal with adequate margins of normal skin as indicated by subsequent pathology. Most melanomas appear in newer moles rather than moles present at birth and are slow growing over several years, with some appearing and growing over a short time. Melanomas evolve, changing in appearance over time and this may be demonstrated over several months. They may change in size, shape, and/or colour. Often a melanoma gets bigger, darker and more irregular in shape but sometimes it may get lighter and smaller. Thin melanomas have a better outlook, thicker ones are more dangerous. A thin melanoma will get thicker over time and potentially spread to involve other organs. Once a melanoma has spread there is no guaranteed cure. A common, freckle-like melanoma found on skin with significant sun damage. Most often seen on the face, neck, hands, and arms, lentigo malignas are increasing in frequency, seen most often in people over the age of 50. Due to needing wide surgical excisions often on the face patients frequently require cosmetic surgery once the lentigo maligna is removed. This is the most common melanoma and generally looks like a regular mole. It can be found anywhere on the body, not just where there is exposure to the sun, but is most commonly found on backs for males and legs and forearms for females. They are likely caused by sunburn before the age of 20 but other causes can include arsenic exposure and drugs used to treat cancer, arthritis or autoimmune conditions. Superficial spreading melanomas are slightly more common on men and most are found on people over 50 years old. They may appear in teenagers but very rarely on children. Considered the least common melanoma but the most dangerous is the nodular melanoma. These melanomas are already thick and invasive and can present in a range of unusual colours from red to blue. Nodular melanomas must be removed as soon as possible. With any skin cancer, early detection is your best defence. If you have any new or changed moles or sunspots, please contact us for an appointment.